Instrumental polka 'Slovenska polka' by Andrej Blumauer (1932-2013) from Slovenia. 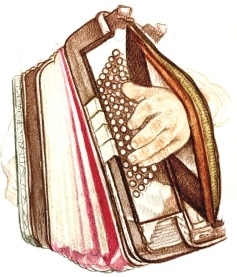 This arrangement for the accordion is inspired by Jože Galič from Slovenia's arrangement for Ansambel Slovenija (melody was played on harmonica by Galič) recorded in the 1980s. 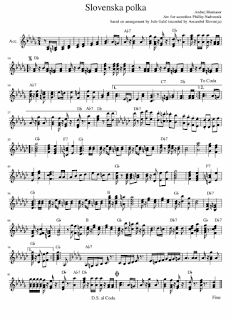 I've written up arrangements in the original key (Db) and in a less challenging key (C).